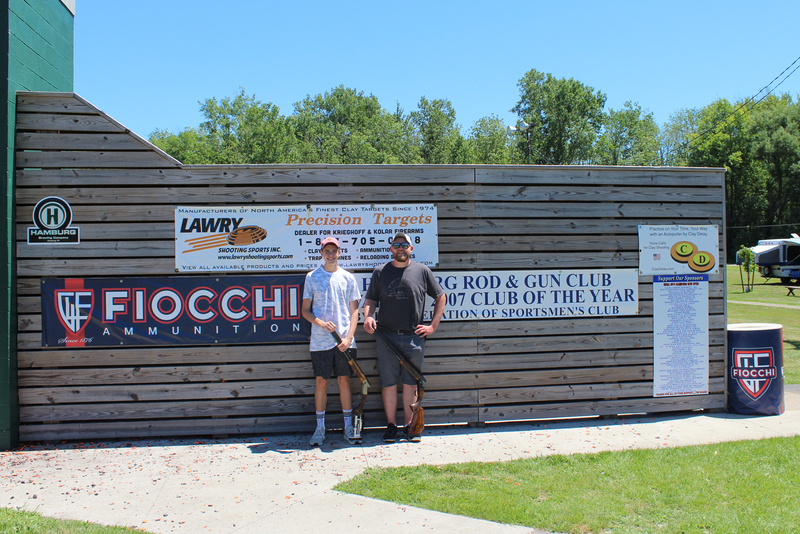 The weather was amazing with sunny, blue skies and warm temperatures for the 2018 Hamburg Open at the Hamburg (NY) Rod and Gun Club, July 6-8. The first event of the weekend was Doubles. Steve Wood was the champion with the only 100 in the event. Since this was Wood’s first 100, we shot his hat. Runner-up was Dessislav Ivanov, and class winners were Ed Smith AA1, Matthew Lenehan AA2, Peter Bogdan A1, Ricky Laurito A2, Bill Black B1, Paul Barnas B2, Mike Kinsella C1, Stacy Asel D1 and John Cicora D2. Matthew Lenehan was Junior champion. Saturday came, and the weather conditions were wonderful again. In the 12-gauge event, there were three 100s. After the shoot-offs, the results were: Ryan Meger – champion, Ed Smith – runner-up, Steven Wood AA1, Daniel Kavanaugh AA2, Bernard Lenehan A1, Ricky Laurito A2, Ed Cornelius B1, Paul Barnas B2, John Cicora C1, Jerry Reeves D1, Stacey Asel E1, Bryan Bale E2 and Ryan Meger – Junior champ. Two shooters were perfect in the 20 gauge. After the shoot-offs, Samuel Heusler was champ and Bernard Lenehan was runner-up. Class winners were Edward Smith AA1, David Sobiegray AA2, Peter Bogdon A1, Douglas Paddock A2, Charles Lombardo B1, Mike Asel B2, Joe Messineo C1 with his first-ever 25 straight (yes, we did shoot his hat), Jerry Reevea C2, Gregory McChesney D1, James Pryor D2 and Ryan Meger – Junior champion. Everyone enjoyed dinner that night with breaded pork chops and roast beef provided by 3 Star Restaurant. A huge thank you to 3 Star Restaurant for the great meal. A nice cocktail party was put on by our club president, Jim McAndrews. On Sunday, the weather cooperated again with a great start for the 28-gauge event. Event champion Ed Smith had the only 100. Other results were Paul Barnas – runner-up, Ryan Meger AA1, Steven Wood AA2, Matthew Lenehan A1, Peter Bogdon A2, William Boyd Black B1, Bruce Raymond B2, Charles Lombardo C1, John Cicora C2, Joe Messineo D1, James Hunter D2 and Ryan Meger – Junior champion. After the lunch break, the weather conditions were perfect for the .410 event. Bernard Lenehan had the only 100, which was his first perfect 100 in the .410, so we shot his hat. Champ was Bernard Lenehan, Dessislav Ivanov – runner-up, Steven Wood AA1, Edward Smith AA2, Ryan Meger A1, Samuel Heusler A2, Ed Cornelius B1, Bruce Raymond B2, Mike Kinsella C1, James Prior C2, Joe Messineo D1, James Hunter D2 and Ryan Meger – Junior champ. Ed Smith won HOA for the shoot with a 395, and Bernard Lenehan was runner-up. Other winners were Ryan Meger AA1, Steven Wood AA2, Samuel Heusler A1, David Sobiegray A2, Paul Barnas B1, John Cicora C1, Joe Messineo E1 and Ryan Meger – Junior champ. We want to thank all the sponsors of the 2018 Hamburg Open for your support, and we hope we can count on you again next year. I would like to thank the following sponsors for the events they sponsored: Doubles – Hamburg Brewery, 12 Gauge – Ventry Heating and Air Conditioning, 20 Gauge – Blackstone Advanced Technologies LLC, 28 Gauge – Manth Mfg., .410 – Russell’s Steaks, Chops & More Restaurant, and HOA – Fiocchi Ammunition. Thanks also to the Boy Scouts for Saturday lunch. We look forward to seeing everyone next year at the 2019 Hamburg Open.